Infrared tubes for fast heat up and cool down times. Movable castors or fixed knobs changeable as per requirement. Very less weight and portable. Easy to lift and place handle. Very less power consumption due to intermittent on. With sturdy powder coated design for long service life. M/C Dimensions - L 30" W 22" H 16"
Manually operated micro registration chest printing machine. All the axis can be easily set by knobs thereby very less time required to set the screen. Highly versatile to print hi-density prints, by setting off contact on the screeen. Heavy duty frame work for long service life. Double adjustable spring system for less maintenance. Perfect registration on all pallets. Smoother operation, with sturdy design. 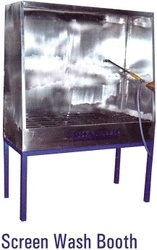 Pallet Size - 22" x 17"
Liquid petroleum gas heater requires no electric power supply. 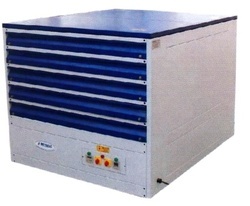 Ideal for chest printing machine. Movable castors to move the machine. Palatte Size - 17" x 22"
M/C Dimensions - L 50" W 28" H 45"
World class metal halide screen exposing machine. 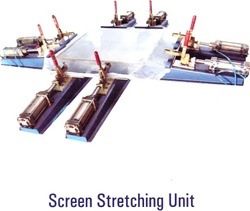 Ideal machine for all types of screens especially high density screens. Easy operation through hydraulic springs system. Electronic Ballast switching for zero maintenance. Instant start halide lamp for long service life. High quality rubber balnket for perfect hugging of the screens. 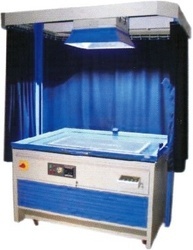 Frame Size - 40" x 45"
M/C Dimensions - L 48" W 24" H 49"
Self contained screen drying cabinet. Easy to load through tray pullout system. Internal air circulation for dust free and fast drying. Adopted with digital temperature and timer controls for proper drying. Heater switch off can be used in case only air drying is required. Easy to move castor wheels. Heavy duty blower for long service life. Very big size there by 40" x 45" screen can be accommodated. M/C Dimensions - L 58" W 48" H 40.5"
High verticle shroud to prevent the excess flock spreading on the floor. Save and re use up to 40% of the flock powder. Adopted with spring balancer for gun for extra ease of operation. Portable machine with castors can be moved any where for opetating. 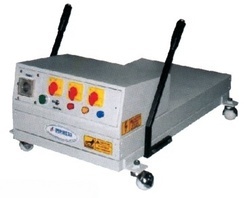 Easy to place base platen for large fabric parts. Heavy duty construction for long service life. 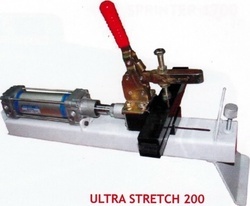 Frame Size - 36" x 36"
Pneumatic stretching clamp easy to use. Each clamp can hold up to 10 inches of screen fabric. Toggle clamp system for holding the fabric. Rubber pressure pads for slip free stretching. Adjustable knob for screen height adjustment. Perfect pressure control from air regulator for precise setting of screen tension. Sturdy powder coated design for long service life. M/C Dimensions - L 30" W 10" H 18"
Ideal machine for trimming and turning of collars. Consistent and precise cutting comparing to manual scissor cutting. Sharp collar point can be achieved very easily. Automatic trimming and turning operation. Easy operation through pneumatic system. Very simple machine there by no requirement of skilled labor. Hardened special steel blade gives long service life. High speed production prevents labor costs and saves money. Machine attached with table makes operation very easy. 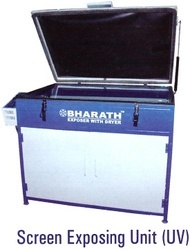 Best machine for small, medium and large garment manufactures. M/C Dimensions - L 20" W 20" H 55"
Easy handling with double spring system. Electric or LP Gas heating options. Ultra fast ink mixing machine. Easy to load and unload with steering system. High H.P motor for mixing all types of inks. Adopted with two stainless steel blades for through mixing and rust free operation. Optional device can be attached for incresing and decreasing the speed. 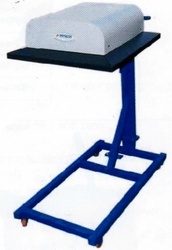 Easy to place base platen for large diameter drums. M/C Dimensions - L 42" W 30" H 80"
Curing for plastisol, pigment, flock, hidensity, foam, sticker, discharge and all types of inks. Non stick teflon conveyor belt. AC motor with adjustable speed regulator. Ceramic & IR type heater with insulation. Two parts heater ON / OFF system. Movable castors for easy movement. Height adjustable as per the chest printing machine. M/C Dimensions - L 38" W 22" H 40"